Lisa Drayer > Lisa’s Beauty Bites® > Press > Are the celery juice health benefits real? Are the celery juice health benefits real? It sounds simple enough: juice a bunch of celery, drink it first thing in the morning on an empty stomach, and wait for the health benefits to roll in. A search for #CeleryJuice on Instagram returns over 35,000 posts, not including all the variations on the hashtag. Some social media users say that drinking celery juice has cured them of mental health problems and infertility. Others credit it with healing eczema that nothing else could cure. One website even claims that it can prevent cancer. Stories touting its “potent healing properties” have appeared on Gwyneth Paltrow’s controversial lifestyle site, Goop. 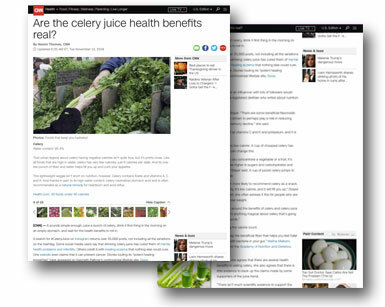 “It’s not a surprise to me that anything a celebrity or an influencer with lots of followers would mention would get a lot of attention,” Lisa Drayer, a registered dietitian who writes about nutrition for CNN, said of the celery juice trend.